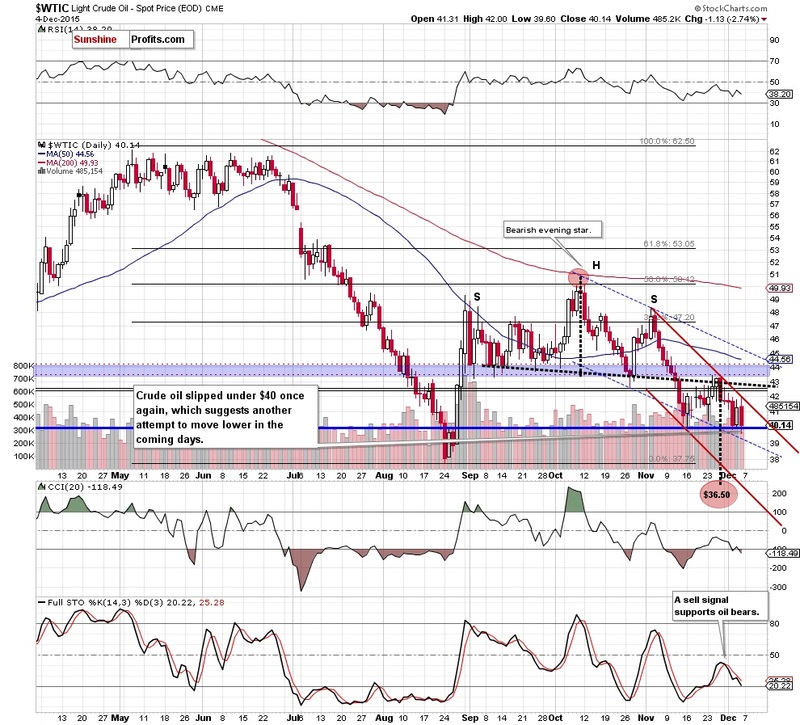 Oil Trading Alert: Crude Oil Under $40! Trading position (short-term; our opinion): Short positions with a stop-loss order at $54.12 and initial (!) target price at $35.72 are justified from the risk/reward perspective. On Friday, crude oil reversed and declined sharply after the Organization of the Petroleum Exporting Countries' decision to keep production high weighed on investors' sentiment. Thanks to these circumstances, light crude lost 2.74% and slipped under the barrier of $40 once again. What's next? The most important event of the previous week was the OPEC's meeting in Vienna. As a reminder, the Organization of the Petroleum Exporting Countries decided to maintain current production levels at around 31.5 million barrels per day, which pushed the price of the commodity to an intraday low of $39.60. Although Friday's Baker Hughes report showed that the number of rigs drilling for oil in the U.S. dropped by 10 last week to 545, light crude closed the day slightly above the barrier of $40. What's next? Let's examine charts and find out (charts courtesy of http://stockcharts.com). (...) the commodity remains under its key resistance zone and sell signals generated by the weekly and daily Stochastic Oscillator remain in place, which suggests another attempt to move lower. Looking at the daily chart, we see that the red declining resistance line (the upper border of the declining trend channel) encouraged oil bears to push the commodity lower (as we had expected). With Friday's downswing, light crude broke below the barrier of $40 once again, which suggests that lower values of the commodity are just around the corner. (...) we would like to draw your attention to a potential head and shoulders formation. 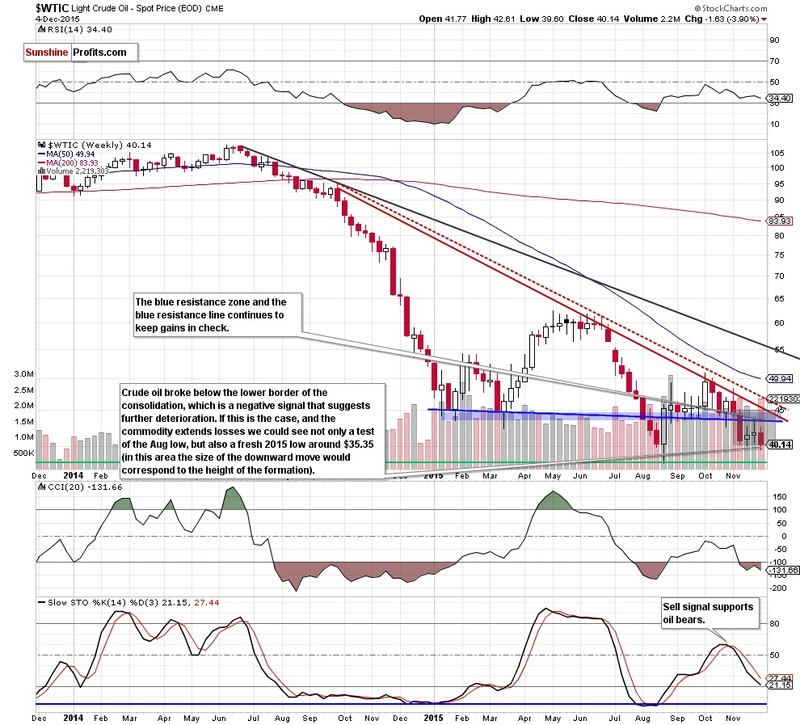 As you see on the chart, last week's upward move took light crude to slightly above the black dashed resistance line. Despite this improvement, oil bulls didn't manage to push crude oil higher, which showed their weakness and resulted in an invalidation of the small breakout. As a result, light crude extended losses and slipped under $40 yesterday, which suggests that the bearish formation is underway. Therefore, in our opinion, if the commodity declines from here, we may see not only a test of the Aug low of $37.75, but also a fresh 2015 low (around $36.50, where the size of the downward move will correspond to the height of the formation). Nevertheless, to have a more complete picture of the commodity, let's find out what impact did Friday's decline have on the medium-term picture. (...) crude oil remains in a consolidation (marked wih grey) under the key resistance zone. A potential breakdown under the lower line of the formation could bring not only a test of the Aug low, but also a fresh 2015 low around $35.35 (in this area the size of the downward move would correspond to the height of the formation). As you see on the above chart, crude oil not only broke under the lower border of the consolidation, but also closed the previous week below it. This is a bearish signal, which suggests that our downside target from the previous alert would be in play in the coming week(s). Summing up, crude oil declined sharply and closed the previous week under the lower border of the consolidation (marked on the weekly chart), which suggests that further deterioration is just around the corner. Therefore, short positions (which are already profitable as we opened them when crude oil was trading around $46.69) continue to be justified from the risk/reward point of view.